The Asus Eee Pad Transformer might be the Trojan Horse of the company on its way to take on a sizable chunk of the Android tablet market. It appeared briefly, and was subsequently pulled out on two retailers' websites - Best Buy and Newegg, at both places for the very decent price of $399. For that kind of money you get a 10" tablet screen with 1280x800 pixels of resolution, 5MP rear camera, 1GB of RAM, and 16GB of internal memory, which is not a bad deal at all, considering the sharp-looking tablet comes with Android 3.0 Honeycomb. 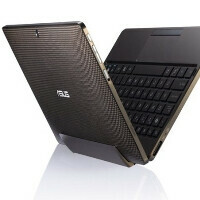 The Eee Pad Transformer was a member of the tablet quartet Asus announced at the CES show this year. The keyboard dock will apparently run you an extra $149, and you gain a chiclet-style keyboard plus and two USB ports. We already wrote that together with the extended battery on the dock the Asus Eee Pad Transformer runs a cool 16 hours unchained from cables, which sweetens up the pot even further. Wow, great price with very nice hardware. Now I have to choose between three different tablets. The TouchPad, the Flyer, and this. All different OS's (well honeycomb and gingerbread are the same OS but you know what I mean) any suggestions? I'm pretty sure I'm going to get the Asus Eee Pad Transformer. There are times when I just need a good netbook/laptop for writing and whatnot and I think this will be able to do most, if not everything, I need. Not to mention the extra battery life gained via the dock. The other thing I like about it, you don't really need a case for it. Just dock it and close it and you are good to go. Nonetheless, I would stay away from any Android tablets that are not running Honeycomb. Once its in stores I am going to check it out. $399.99 is a great price, for a tablet. I have the wifi xoom $600, asus tablet with dock= $550.